April 13, 2019 – Dry and warm weather today. Mountain precipitation spreads in Sunday, becoming widespread by Monday with light to moderate snow accumulations Monday evening into early Tuesday. Drier and warmer conditions return by the middle of next week. Warm and dry conditions will be seen today as an upper level ridging continues over California. Above average high temperatures in the Valley will range from the mid 70s to around 80 degrees, with higher elevations in the 50s and 60s. 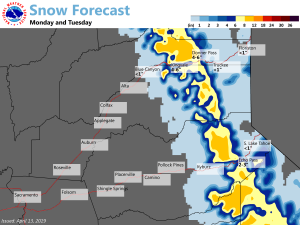 A weak wave will skim far northern California Saturday night into Sunday bringing light precipitation to primarily the northern mountains and foothills and mountains of the Sierra north of I-80. Some light snow may reach the highest peaks. Dry weather is expected elsewhere with increasing clouds through the day. 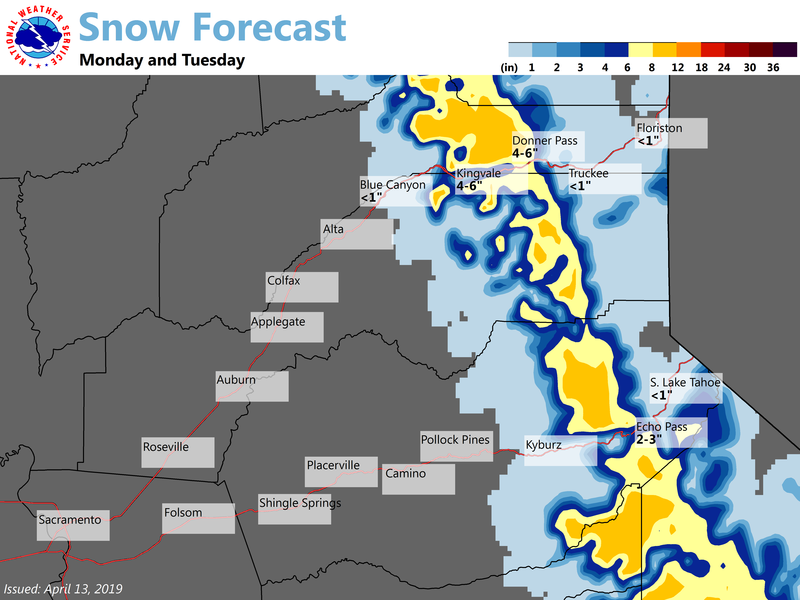 A stronger wave moves in from the northwest Monday into Monday night bringing rain and mountain snow back to NorCal. 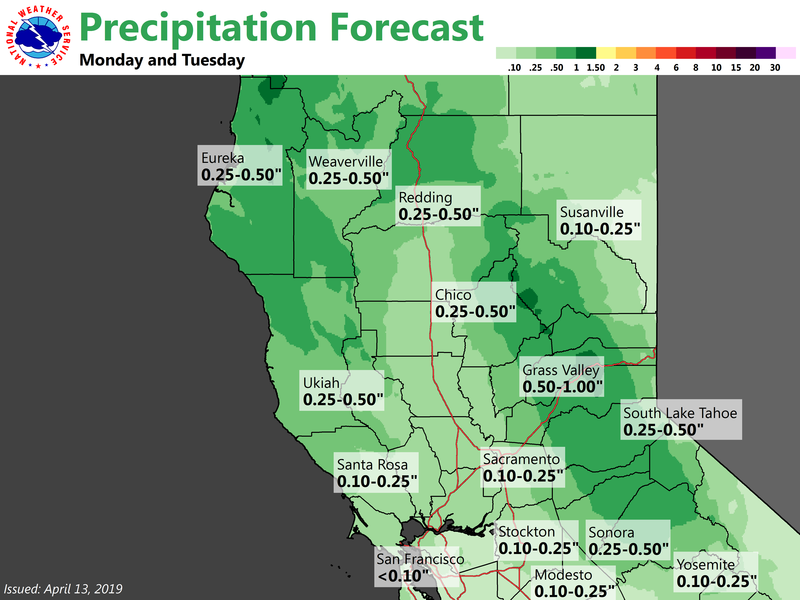 By Monday morning, precipitation will be mainly confined to areas north of I-80, with precipitation overspreading all of NorCal by the afternoon hours. 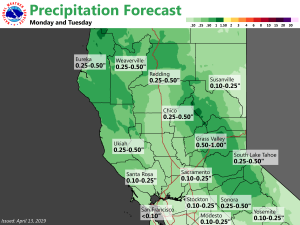 Rain will be fairly light in the Valley with amounts ranging from a tenth of an inch up to a quarter of an inch, with the heavier precipitation amounts seen in the foothills and mountain regions. Cooler air with this system will drop snow levels to around 6000 feet, with snow accumulations generally around 4 to 6 inches. Expect below average temperatures as well on Monday, with highs generally 5 to 8 degrees cooler than normal. Upper level ridging begins to move back over California Tuesday clearing any lingering precipitation in the mountains and foothills. Broad ridging over the eastern Pacific and NorCal will lead to dry and mild conditions late next week. Temperatures will be around 5-10 degrees above average.